As mother and daughter, Carmen and Gisele Grayson thought their DNA ancestry tests would be very similar. Boy were they surprised. 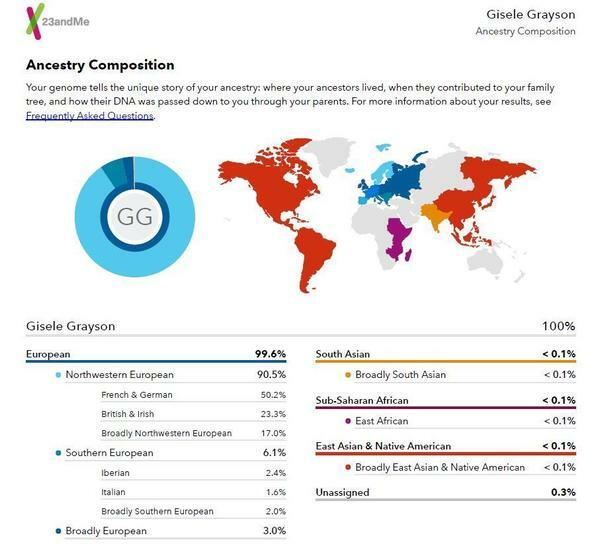 The author got her name from her Italian grandmother, Gisella D'Appollonia, but, according to two DNA ancestry tests, not a lot of genes. My mom, Carmen Grayson, taught history for 45 years, high school and college, retiring from Hampton University in the late 1990s. But retired history professors never really retire, so she has been researching her family's migrations, through both paper records and now a DNA test. Her father was French Canadian, and her mother (my namesake, Gisella D'Appollonia) was born of Italian parents. They moved to Canada about a decade before my grandmother was born in 1909. Last fall, we sent away to get our DNA tested by Helix, the company that works with National Geographic. 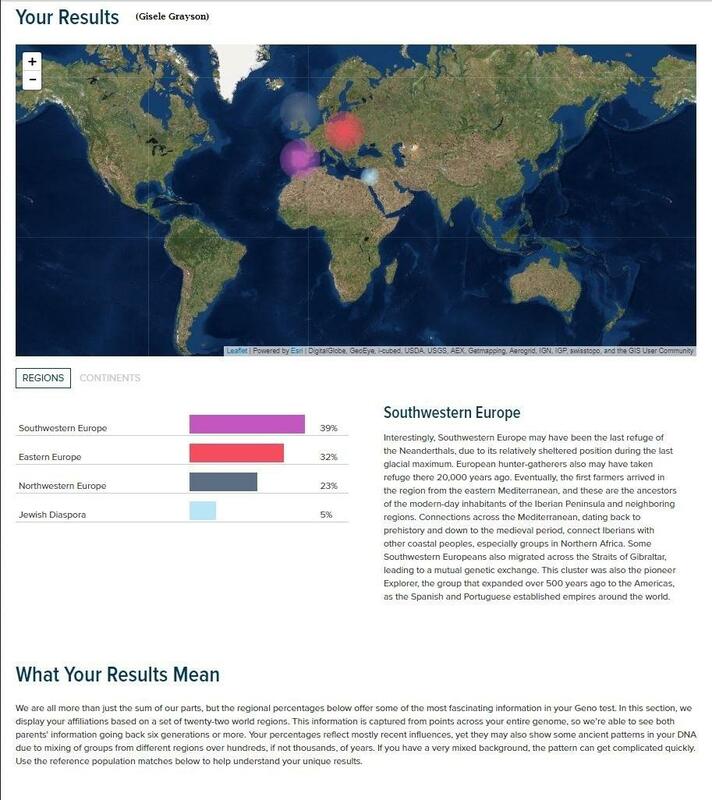 Mom's results: 31 percent from Italy and Southern Europe. That made sense because of her Italian mother. 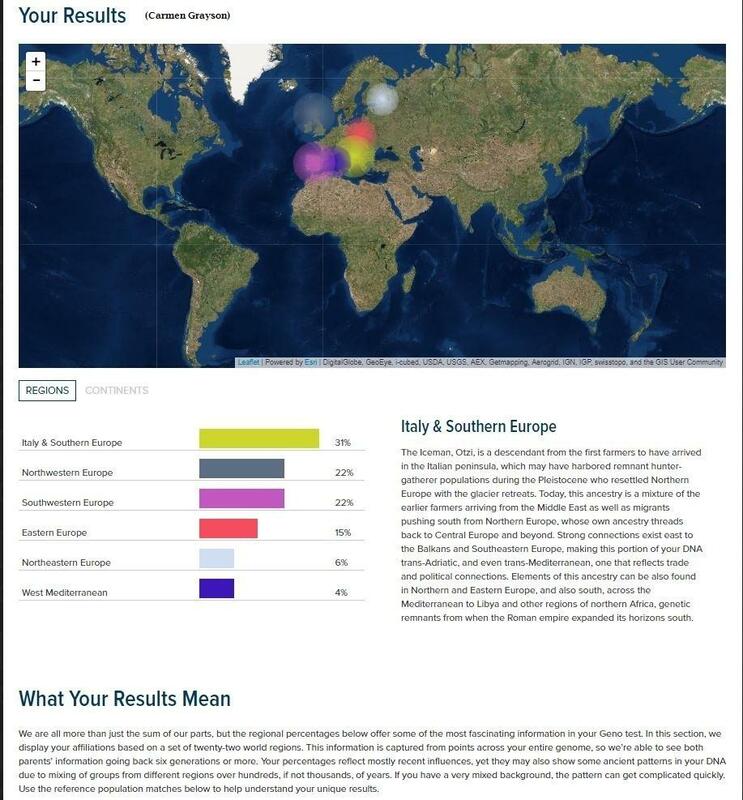 But my Helix results didn't even have an "Italy and Southern European" category. How could I have 50 percent of Mom's DNA and not have any Italian? We do look alike, and she says there is little chance we were switched at birth. We decided to get a second opinion and sent away to another company, 23andMe. We opened our results together and were just as surprised. This time, I at least had a category for southern Europe. But Mom came back as 25 percent southern European, me only 6 percent. And the Italian? Mom had 11.3 percent to my 1.6. So maybe the first test wasn't wrong. But how could I have an Italian grandmother and almost no Italian genes? To answer this question, Mom and I drove up to Baltimore to visit Dr. Aravinda Chakravarti of the Johns Hopkins University School of Medicine and the Bloomberg School of Public Health and who has spent his career studying genetics and human health. "That's surprising," he told us when we showed him the results. "But it may still be in the limits of error that these methods have." The science for analyzing one's genome is good, Chakravarti says. But the ways the companies analyze the genes leave lots of room for interpretation. So, he says, these tests "would be most accurate at the level of continental origins, and as you go to higher and higher resolution, they would become less and less accurate." My 23andMe test also showed less than 1 percent of South Asian, Sub-Saharan African, and East Asian & Native American. This, Chakravarti says, is likely true because the genetics of people on a continental level are so different, and it's not likely South Asian is going to look like European. "Resolving a difference between, say, an African genome and an East Asian genome would be easy," he says. "But resolving that same difference between one part of East Asia and another part of East Asia is much more difficult." 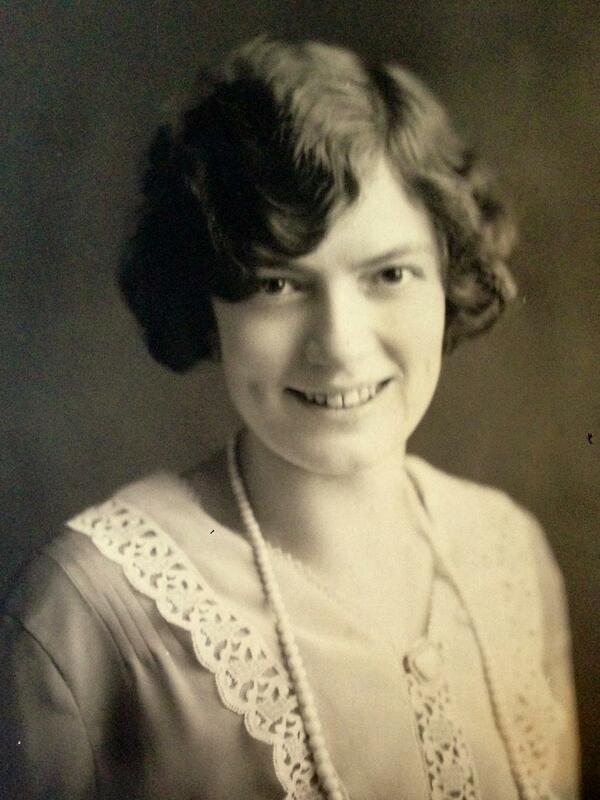 I also learned that even though I got half my genes from Mom, they may not mirror hers. We do have the genes we inherit — 50 percent from each parent. But Elissa Levin, a genetic counselor and the director of policy and clinical affairs of Helix, says a process called recombination means that each egg and each sperm carries a different mix of a parent's genes. 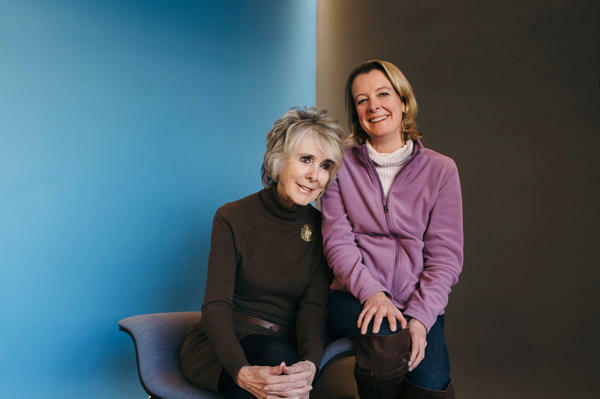 "When we talk about the 50 percent that gets inherited from Mom, there's a chance that you have a recombination that just gave you more of the northwest European part than the Italian part of your Mom's ancestry DNA," she says. That is also why siblings can have different ancestry results. The companies compare customers' DNA samples to samples they have from people around the world who have lived in a certain area for generations. The samples come from some databases to which all scientists have access, and the companies may also collect their own. "We're able to look at, what are the specific markers, what are the specific segments of DNA that we're looking at that help us to identify, 'Those people are from this part of northern Europe or southern Europe or Southeast Asia,' " Levin says. As the companies collect more samples, their understanding of markers of people of a particular heritage should become more precise. But for now, the smaller the percentage of a population within a continent that is in the database, the less certain they are. Levin says Helix chooses to not report some of those smaller percentages. The 23andMe reports results with a 50 percent confidence interval — they're 50 percent sure their geographic placement is correct. Move the setting up to 90 percent confidence, meaning your placement in a region is 90 percent certain, and that small 1.6 percent of my ancestry that is Italian disappears. The ancestry tests also have to take into account the fact that humans have been migrating for millennia, mixing DNA along the way. To contend with that, the companies' analyses involve some "random chance" as Levin puts it. A computer has to make a decision. And the ancestry companies have to make judgment calls. Robin Smith, a senior product manager with 23andMe, says their computers compare the DNA with 31 groups. "Let's say a piece of your DNA looks most like British and Irish but it also looks a little bit like French-German," he says. "Based on some statistical measures, we'd decide whether to call that as British-Irish or French-German, or maybe we go up one level and call it northwestern European." "It was a bit surprising," he says. "But in looking at the fact that you have some southern European and some French-German, the picture became a little clearer to me." 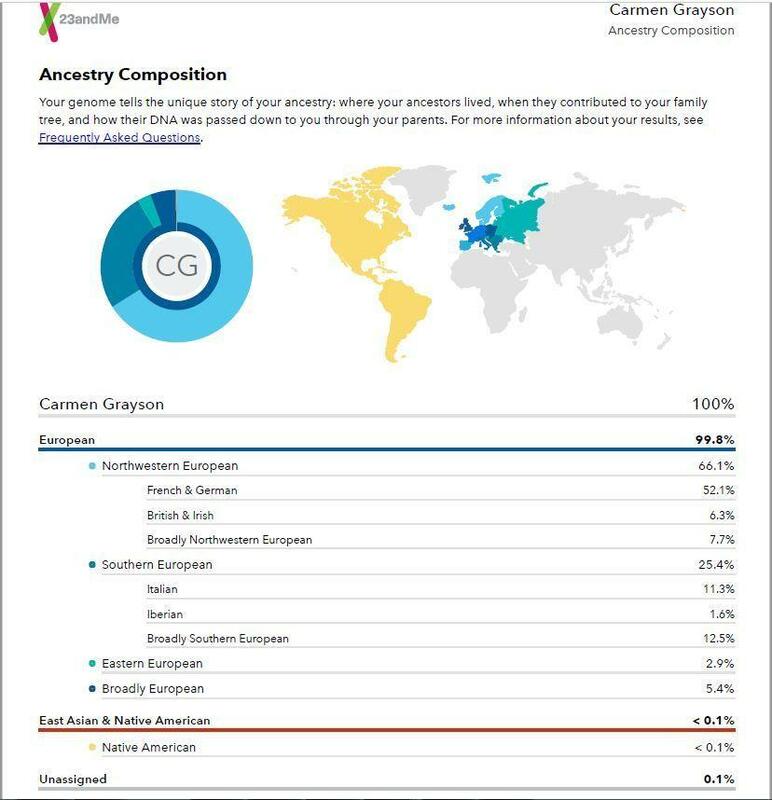 So, for now, my Italian grandmother doesn't show up in these tests. No matter — Chakravarti, Levin and Smith all say let the results add to your life story. The DNA is just a piece of what makes you you. Gisele Grayson is a senior producer on NPR's Science Desk who runs the health reporting collaboration with member stations and Kaiser Health News. MARTIN: And just a note - the company 23andMe mentioned in this story is an NPR funder. Transcript provided by NPR, Copyright NPR.